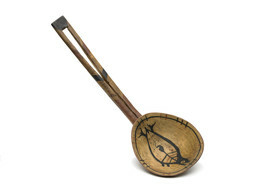 The painting of a seal on this serving ladle recalls a traditional ritual practice. Women greeted seals that their husbands had killed, using a ladle to offer the animal fresh snow or drinking water and to sprinkle moisture on its flipper joints. This completed the seal’s journey from water to land and satisfied its thirst. The seal’s spirit would let others know to come to the hunters of that village. John Phillip, Sr.: Angassanek wangkuta pilaqait wangkut nunamteni . . . Ipuutneng, angassanek. Nena Rivers: Everything [has to be] painted. . . . Design-arluki kenekluki pituit. Virginia Minock: Waten tang pingqerrlalriit, malruuluni, pingayun, tua akulini malruneng. Nena Rivers: Qaraliuciqait [It would be their design]. Qaralilituut makuneng [They put this kind of design] to make it look pretty . . . they’re only for decoration. Joan Hamilton: Seal, una-ll’ cauluni [and what is this]? Nena Rivers: Anrutaa-llu alaunani, anrutaruara una . . . . Atuunrilengraata piugtacimegcetun. Nena Rivers: And everything they make has to have red . . . We all have red clay, these are from the clay that they made. They make sure to put oil on it, so it will stay longer. Virginia Minock: And so it won’t crack. Nena Rivers: And it does not wash off, and it will always be reddish. But they never leave it completely pale, they have to put some fancy in here.